Barlen Pyamootoo comes from the tiny island nation of Mauritius, but as he explains, there are so many more ways to describe him than “a Mauritian writer.” Aside from writing three books, he has also founded two publishing houses and directed a film adaptation of his own book, Bénarès. 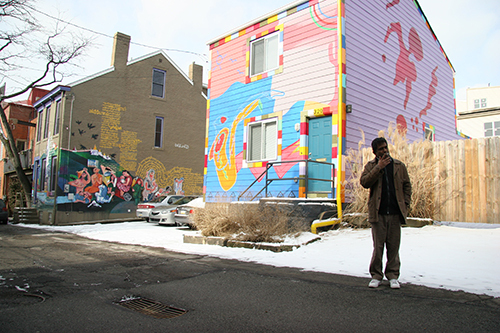 Pyamootoo came to City of Asylum/Pittsburgh in November 2012 after participating in the University of Iowa’s International Writing Program. The goal of his three-month residency in Pittsburgh was to continue to work on his fourth novel, which he began in 2002 and abandoned in 2005 to write Salogi’s, a tribute to his late mother. At the end of his residency in February, he sat down with Sampsonia Way to discuss what it was like to return to his unfinished novel after ten years. Also discussed were the challenges of being a writer in Mauritius, the struggle of adapting his own book into a film, and the transnational nature of literature. 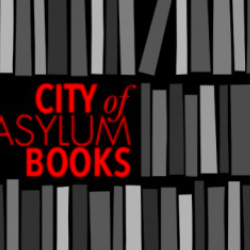 Included in this interview are three questions asked by audience members during Pyamootoo’s January 8th reading at City of Asylum/Pittsburgh. What is it like to be a writer in Mauritius? I don’t think it depends on the size of a country to have good or bad writers. What really matters is the history of literature in each country. Mauritius has a long history of literature. For example, the first newspaper in Africa was published by the French in Mauritius in 1773. However, one problem for Mauritian writers is that if you are published in Mauritius you stay in Mauritius. It’s not a big country, it’s about 1.2 million people, so you don’t have many readers, but if you are published in France or in England, for example, it will be better. Again, the history of literature and where you get published can both be very important. I found a review of In Babylon and Bénarès on a blog called “A Year of Reading the World.” This blogger read a book from every country in the world, and you were the writer from Mauritius that she read. How do you feel about representing your country as a writer? I don’t look at my country like I belong to it; I belong to literature. If I had to give my body to something, it would not be to my country, it would be to literature. 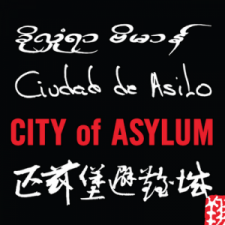 Literature is transnational, so although I like that this blogger talked about my books, I don’t think that I’m a representative of my country because there is no passport in literature. What was it like to adapt Bénarès? Had you ever worked in film before? Did you decide to direct it because you were protective of your work? No, I wanted to direct because I’m an adventurous person. If you tell me to try theater I’ll do it. It’s not to protect my work; once I’ve written a book what happens to it after, how it’s translated, etcetera, is not my business. It seems like adapting your own work could be a very difficult process because there’s Barlen the Director and Barlen the Writer in a struggle. Did you ever struggle while you were directing the film? Yes, perhaps because it was my first film. I was so attached to the book, and I should have been more schizophrenic. That is, I should have separated myself from the writer because cinema is a different kind of writing. What was the hardest part to adapt? The interior monologue, or what’s happening in the mind of the narrator. How can you show that? But, it was great to think about how to translate that interiority into images. 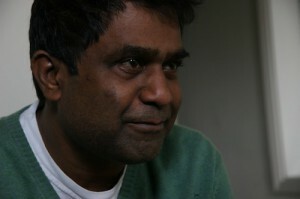 You are the first Mauritian filmmaker to use Mauritian Creole in a film. Why did you make this decision? A book is a conceptual thing while a film deals with what you can see and isn’t just in the mind. Imagine you are in a small village in China, and the people are talking in English. It would be bizarre. That’s why they’re talking in Mauritian Creole, because that’s how we talk in Mauritius. It’s not quite real life, but it’s more real than a book. Can you tell us what have you been writing about in Pittsburgh? The title in French is L’île de poissons toxiques, in English it’s The Island of Poisonous Fish because when the Arabs came to Mauritius in the fifth century they gave it that name. It’s about a man who disappears, but I can’t really talk about a book I’m still writing. You started writing L’île de poissons toxiques in 2002 and then stopped in 2005. Now that you’ve returned to it, do you see the piece differently? Has this given you any insights into how you’ve changed or grown as a writer? I think it’s very different from the book I started in 2002 because I’m 10 years older, and I’m much more experienced. I think you can compare it with love: You fell in love with someone 10 years ago, and then someone else, but love always seems like a new thing happening to you. At the end of the year, when I finish this novel, I will find out its differences from the book I started in 2002. Can you talk about some specific differences you’re noticing? The story and plot are the same; it is still about a man who disappears. But, for example, I had started the book when the person has already disappeared and now I’ve started with the character before he disappears. That makes a huge difference. And are you planning to film L’île de poissons toxiques? Perhaps. This is my plan, but we’ll see. I must first finish this book, write a travelogue of my experiences in the United States, and then I can think about another film. It’s difficult to imagine both. Of course each book is very different because the approach is different. I can talk more easily about the difference between the last book, Salogi’s, which was about my mother, and the first two which are fictional. I wrote Salogi’s because I wanted to talk about my mother. Some people said to me afterwards “Writing the book must have made you feel better.” But the book was not for my benefit. You don’t have to feel good about a book when you talk about another person. It was very autobiographical, but it’s also literature. When I wrote Salogi’s it was, in French you’d say “une voix blanche,” that is a white voice, a neutral voice. When I wrote In Babylon I told myself that I had to open my eyes and ears and be extravagant. As the critics say, for me “each word counts,” and I can’t write otherwise. As for this book I’m writing, I’m glad to be here because the preparation was in Mauritius, and now I’m expanding the original idea. Even the location between your two published fiction books are different. Bénarès was set in Mauritius, and In Babylon was set in Iraq. Why is location so prominent in your writing? You’ve heard of historical fiction, but geographical fiction also exists. We are migrants in my family, so geography is quite important to me. The book I’m working on now is about geography too. The character disappears and goes to other places. People consider time to be a key element because literature is about memory and the loss of memory, but when you read a book by Gabriel García Márquez or Proust, for example, it’s always about the place as well. Next I’m going to be writing a travelogue about the time I spent during my six-month trip in the United States, and Pittsburgh will play a very important part. It’s not just the landscape, which I love, but the people. I think people can be like the place where they live. I have notes, but I don’t know what will happen with this travelogue. You’ve founded two publishing houses, Alma and L’Atelier d’ecriture. What are your goals, as a publisher? I was in France, in the intellectual society, and I wanted my country to have more intellectual activity. I wanted to promote literature. That’s why, when I returned to Mauritius in 1995, I founded Alma. I stopped publishing for years to do my writing and the film, and then in 2009 I started L’Atelier d’ecriture because I wanted to work with young writers. My goal was to build a link between writers from Mauritius and publishers in France. Because my books are published in France, I have some connections, so I felt it was my job to help writers from Mauritius. Now I have to be more selfish and diminish my publishing work because I don’t have time. Sometimes I neglect my own work, which is not good. If our readers want to read more Mauritian writers, who would you recommend? Bertrand Meunier, but I don’t think he’s been translated into English. There are many others, but they are not published in English. For people who can read in French, it’s fine, but for people who can’t, translation is a big problem. Natacha Appanah, Bertrand de Robillard, Ananda Devi, Carl de Souza, and Shenaz Patel are some I would recommend. Before coming to Pittsburgh, I wrote about Pittsburgh even though I didn’t know a lot about it. Every time I imagined snow everywhere. I was afraid of snow because I didn’t want to get sick, but Henry told me it would be good for me to write here because I would be shut up in my house. One Comment on "Barlen Pyamootoo: “There is No Passport in Literature”"